You are at:Home»Herbs»Ruta graveolens Linn. Latin name : Ruta graveolens Linn. Description : Rue is a herb with an ancient history. The genus name ‘Ruta’ comes from the Greek word ‘reuo’, to set free, showing its reputation as a freer from disease. Leaves are abortifacient, anthelmintic, antiepileptic, antiinflammatory, carminative, emetic, emmenagogue, expectorant, haemostatic, nervine, rubefacient and mildly stomachic. The herb is also considered antispasmodic, diuretic, resolvent and strongly stimulant. It is used as a stimulant to the nervous system and uterus. Useful in skin disorders, cramps in the bowel and hysteria. It is chiefly used to encourage the onset of menstruation and as a remedy for menstrual disorders such as PMS. It stimulates the muscles of the uterus and promotes menstrual blood flow. It also strengthens the stomach, aids digestion and is useful in sluggish liver. 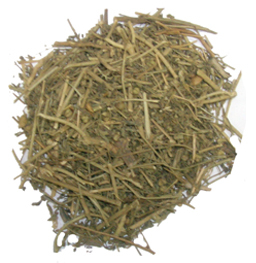 The herb is also used to ease colic and reduce flatulence. The herb was prescribed in cases of vertigo and epilepsy in the 17th century. Many of Rue’s positive benefits can be traced to its high concentration of the bioflavonoid, Rutin. Among other benefits, Rutin is known to strengthen blood vessels, thus reducing the likelihood of varicose veins, and improving overall cardiovascular function. Rue can also be made into an ointment for external use against gout, arthritis, rheumatism and neuralgia. Recommended Dosage : 3 to 5 g powder of dried herb. Contraindication : This herb is not recommended during pregnancy as Rue has been known to cause spontaneous abortion. Do not use if you are taking blood thinners or if you have impaired kidney function. Due to its emetic tendencies it should not be administered immediately after eating. Avoid large doses.